January 7th, 2010: Sunny and Pleasant, Air temp 36*, Water Temp 41* and Clear. We hit the water at 7 this morning, air temp was a brisk 18*. Our intentions were to pull shallow flats early with planner boards and as the day progressed pull back to 25 to 30 foot flats and run downlines rigged with Herring. I had also rigged some rods with artificial baits so we could cast to keep warm and so maybe have some fun seeing Stripers explode on the surface but after the first 15 minutes after we got our boards wet we forgot about lures for awhile. We had the lake to ourselves for 2 hours and in that amount of time we never quit baiting and reeling in fish. By 10 o'clock we had limited out and started playing with lures. We worked swim baits, top water, jerk baits and spoons for an hour. After catching only punks on lures we decided to call it a day, and what a morning it was. Vince is pictured with one of the 2 Bass he caught today and also with a nice Striper. 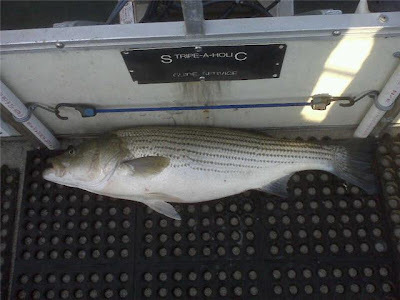 The Striper laying on the deck is a 17 pound fish caught and released by Anthony. Each square in the mat is 12 inches.We took pictures of plenty of fish but only had room for a few on my journal. Thanks to Brian and Anthony for throwing for bait this morning, my morning was "Sweet", all I had to do was control the boat, bait the lines and net the fish. I lost count of how many fish we caught this morning, but we probably released as many as we kept to fight again. It doesn't get much better that a January or February day with little wind, no boat traffic, good friends and a tank full of Herring.